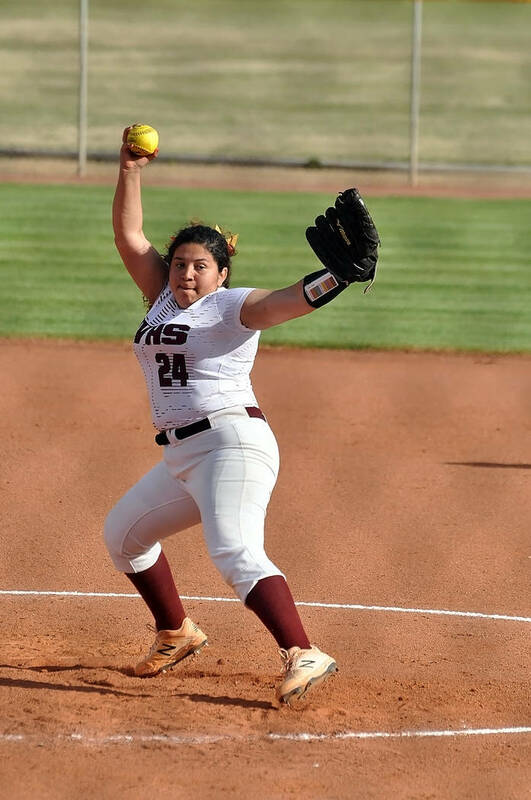 Horace Langford Jr./Pahrump Valley Times Natalie Waugh-Magana tossed a 3-hitter as Pahrump Valley improved to 4-0 in the Sunset League on Friday with a 12-1 rout of Mojave in Pahrump. Horace Langford Jr./Pahrump Valley Times Sophomore pitcher Jalen Denton delivers Friday against Mojave during Pahrump Valley's 5-3 Sunset League victory over the Rattlers. 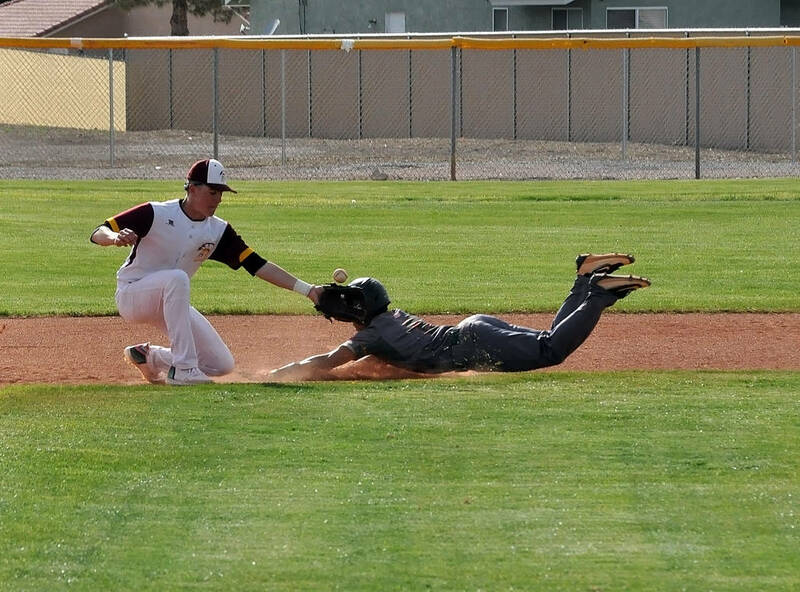 Horace Langford Jr./Pahrump Valley Times Pahrump Valley junior shortstop Chase McDaniel waits for a throw on a stolen base against Mojave on Friday in Pahrump. McDaniel went 2-for-4 with an RBI and a run scored during the Trojans' 5-3 win. Skyler Lauver, Nicky Velazquez and Hailey Cuellar also had hits for the Trojans (15-7), while Velazquez drove in the other run. Desert Oasis (12-9), of the Class 4A Desert League, outhit Pahrump Valley 17-5 and did not commit an error while the Trojans committed three. On Friday, Deanna Egan homered and drove in 2 runs while Jackie Stobbe tripled and drove in 2 runs as the Trojans took command of the Sunset League race with a 12-1 rout of Mojave in Pahrump. Natalie Waugh-Magana tossed a 3-hitter for Pahrump Valley (4-0 Sunset), which pounded out 13 hits. Mojave is 5-5 overall and 3-1 in the Sunset. 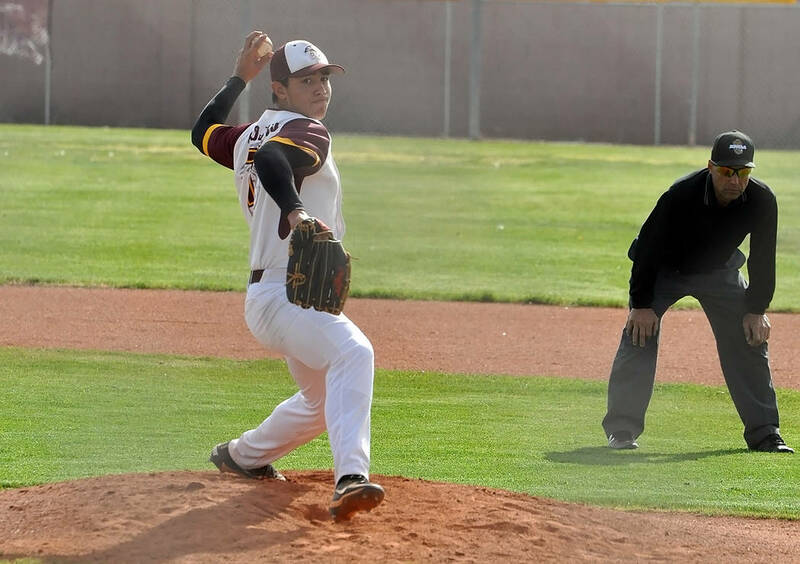 Senior pitcher Joey Koenig tossed four innings of 1-hit relief, striking out eight to earn the win and went 2-for-4 and scored a run as the Trojans rallied past Mojave 5-3 on Friday in Pahrump. Junior Chase McDaniel also went 2-for-4, drove in a run and scored a run for the Trojans (10-5, 3-1 Sunset). Willie Lucas also had an RBI and a run scored, while Reace Millette, Jalen Denton and Dylan Grossell each had a hit. Millette had Pahrump Valley’s only extra-base hit, a double, and also scored a run, as did Tyler Floyd. Koby Lindberg shot an 81 on the par-72 course at The Legacy Golf Club in Henderson to lead the Trojans to a 31-stroke victory in an April 2 Sunset League match. The Trojans’ total of 360 easily outdistanced Western (391) and Del Sol (491). Western’s Jared Smith continued his strong season, earning medalist honors with a 2-under 70. Lindberg was second, while Pahrump Valley’s Caleb Sproul’s 92 was good for fourth. Lindberg and Sproul had the only birdies of the day for Pahrump Valley, both of them on the par-5 No. 5 hole. Right behind for the Trojans were Ian Kingsley (7th, 94), Trevyn Wombaker (8th, 95) and Kasen Moore (9th, 99). Get live scoring updates, links to sports stories, breaking news, photos and observations on Pahrump Valley High School and other Nye County teams on our Twitter feed. Follow @PVTimesSports.